DEAL HAS ENDED! Sorry Yall! When I read about this deal, my jaw just dropped! I couldn't believe it! 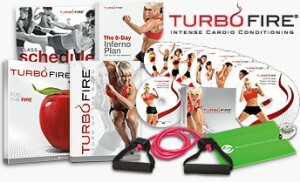 Beachbody TurboFire Fitness Program Sale $53! Hurry!Get it while its HOT! You get everything in the photo! And if you complete the program and turn in a simple form, they will send you a free TurboFire Tanktop! What!!!! There is a reason it's called TurboFire. It's intense, it's fun, it will get your heart pumping and your fat will disappear. This deal wont last long, so get it now. They are only selling a certain number at this price. Once it's gone, it's gone. Contact me, Coach Jen, to get involved in our 90 Day Fitness Challenge Group. We provide a meal plan each month, and a support group to get plugged into for accountability and encouragement. The group is at no additional cost.